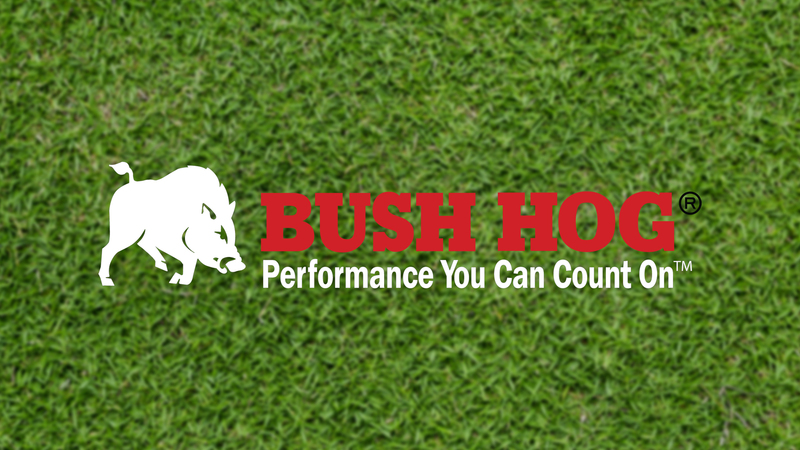 The Bush Hog 1815 Flex-Wing Rotary Cutter is designed to cut weeds, grasses, and brush up to 2 1/2-inches diameter, and this unit is a great choice for tractors in the 60 to 130 HPclass. The 1815 is recommended for pasture maintenance, corn shredding, drainage areas and general maintenance locations such as air strips. The 1815 has maintenance friendly features, smooth decks for E-Z cleaning, high performance cutting and distribution, and like all Bush Hog® rotary cutters, it is built Bush Hog® tough for years of dependable service. Grease fittings and steel bushings at axle pivot points for extended life at pivot areas. Each axle arm on the center section has a rubber cushion to absorb the shock loads near the wheel. Patented oil sight gauge in all three cutting gearboxes for quick and easy monitoring of oil level. Bush Hog’s E-Z lube drivelines are quick and easy to service. All grease fittings on the PTO CV driveline and wing drivelines closely align for quick location of grease points. Wing free float is 22° down and 25° up without movement of hydraulic cylinder rod for extended cylinder life. Bush Hog’s E-Z lube drivelines are quick and easy to service. All grease fittings on the pto CV driveline and wing drivelines closely align for quick location of grease points.